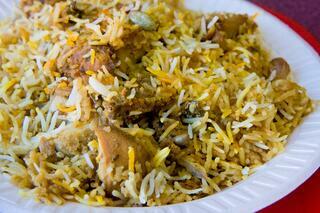 Dum Biryani involves marinating and cooking the meat (usually mutton or chicken) with the biryani rice. It is fragant and aromatic and the meat pretty much melts in your mouth. Our absolute favorite Indian food. 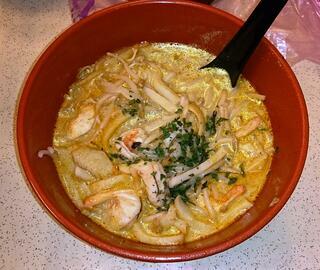 Laksa is a spicy noodle soup in the Peranakan cuisine, a combination of Malay and Chinese cuisine that is common in Malaysia and Singapore. 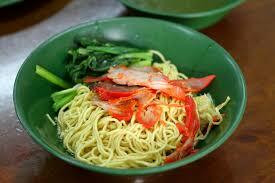 The place to have laksa in Singapore is definitely 328 Katong Laksa, which has a long history and is a crowd favorite. 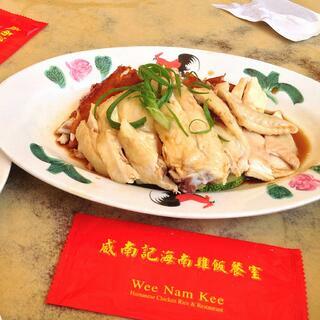 Here's a fun fact: Hainanese Chicken Rice is not actually from Hainan Island of China. This is where we'd bring our guests for their first experience of chicken rice. You get to choose between white chicken and roasted chicken or if you are feeling hungry, get both to share. The restaurant also serves a pretty good roasted meat dish. 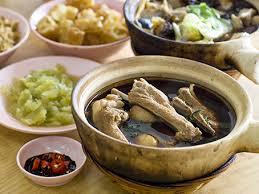 Bak Kut Teh is pork rib steeped in peppery broth and herbs. It makes for a nice warm meal and a perfect supper. Sin Heng serves a different version of Bak Kut Teh than the rest of Singapore - it's Klang (a city in Malaysia) version with soy sauce based soup instead of the clear soup you'll find elsewhere. 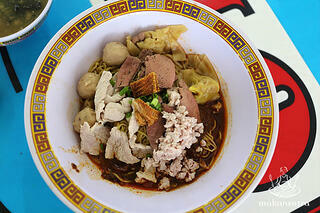 Wantan mee or wantan noodle is a Chinese noodle served with roasted pork meat (char siew) and dumplings (wantan). The noodle at Eng's Noodle is chewy, springy and the combination of green vegetable, char siew, and wantan are just perfect. The shop is well-known for their fiery chili sauce that we love. Kay Lee makes mean roast duck and roasted char siew that's charred on the ouside but stays tender when you bite into them. Pair them with rice or noodle, whichever you like. The store sits on the restaurant-filled Tanjong Katong Road, next to Eng's Noodle, but still received a good traffic of hungry office workers every day. Perhaps one of the most famous nasi lemak shops in Singapore, Ponggol Nasi Lemak can be said to be Chinese style nasi lemak (nasi lemak is traditionally run by Malay chefs). 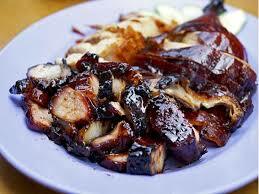 Its fried chicken is to die for, the otah (grilled fish paste), shrimp paste, and vegetables are also crowd favorite. This nondescript stall usually receives a 1-hour long queue at the minimum during weekend, and 45-minute queue if you are lucky during weekday lunch hours. It recently received one Michelin star status, and is one of the only two hawker stalls in Singapore (and the firsts in the world) to do so. Tai Hwa bak chor mee (minced pork noodle) combines minced pork, lard, seasonings, liver slices into one steaming bowl of goodness. Chin Mee Chin Confectionery retains its old coffeeshop charm from when it was built in 1925 by a Hainanese chef. Its specialty is serving the traditional kaya toast untraditionally. 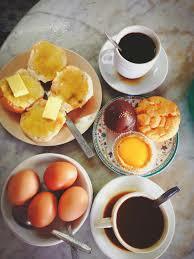 Instead of the square toast most people are used to, CMC's kaya toast is served on a bun, with a slab of butter and kaya jam. Paired with their teh c siew dai (local lingo for tea with evaporated milk, less sweet), it's the perfect lazy morning weekend breakfast while watching the people walk by. For the adventurous, if you can and are willing to have new food experience, do try the frog porridge at Dunman Centre. 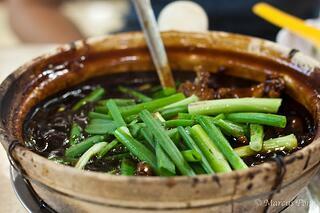 The claypot frog porridge comes piping hot, and the rice porridge is slowly cooked over high heat and doused in sweet soy sauce. Delicious. 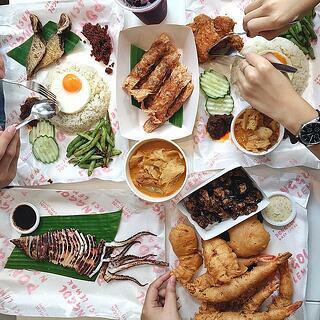 So there you go, the top 10 local food you need to try in Singapore! Check out our other blog posts and our free e-guide: Singapore Travel Starter Kit.